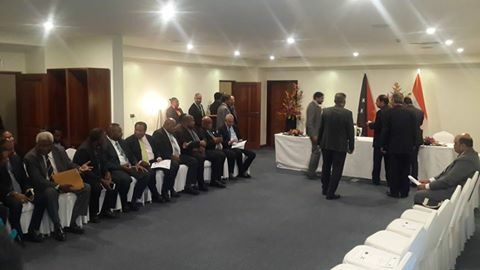 It’s much needed assistance that our Government needs during this time and four major agreement signings that took place this morning between PNG and India is hoped to strengthen bilateral ties between the two countries. In the first signing, India’s Minister for Agriculture and Farmer’s Welfare, Dr Sanjeev Kumar Balyan signed an MOU with Health Minister, Michael Malabag on Cooperation in the Field of Health Care and Medical Science. The overall objective is to establish comprehensive inter- ministerial relations with the goal of upgrading the quality and reach of human, material and infrastructural resources involved in Health Care and Research in both countries. Key areas are Public Health, HIV/AIDS, Capacity Development of Health Professionals through training and Drug and Health Care technologies, Health Research and Environmental Health. The second, is an MOU regarding a 100 US Dollar Million Credit Line between PNG and the Export –Import Bank of India, which was signed between the General Manager of EXIM BANK, Mr Utpal GOKHALE and Deputy Secretary- Economic Policy for Treasury, Manu MONO. This will see an upgrade of the National/Supreme Court house in Mt Hagen- 20M, Madang Roads- 60M, Kimbe/Hoskins Highway- 20M. The third was a signing of MOU between the Indian Council of Agricultural Research, New Delhi and UNITECH for an upgrade of the University’s ICT and Agricultural Research. The 4th is an MOU between the Government of India and the PNG Government for the establishment of the India- PNG Centre for Excellence in IT.